Voice acting fans will be happy to hear that the fan favorite documentary I Know That Voice will be returning as a documentary series. The series, with the same title, is set to be released in winter of 2018 and will continue to work through the interviews from the film. Producer and voice actor John DiMaggio explained that the original film had over 150 interviews and over 160 hours of film. Looking back he wished that more people had been able to make it into the film, like well-known voice actor Troy Baker. 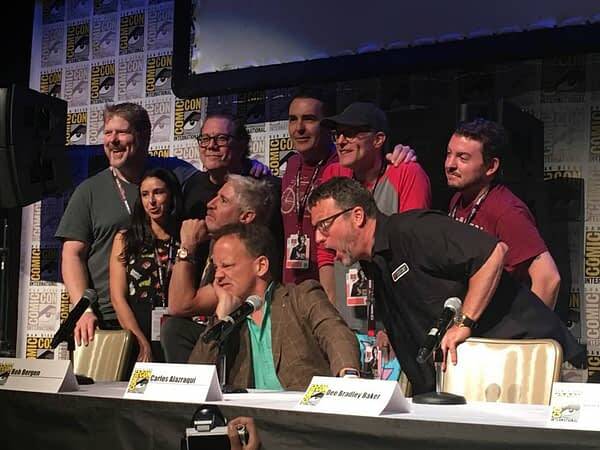 DiMaggio was joined for the series announcement by many of the voice actors who appeared in the documentary, including Dee Bradley Baker, Carlos Alazraqui, Bob Bergen, Jessica DiCicco, Nolan North, Steve Blum, and Frederick Tatsciore, as well as producer Sean Flanagan. You might thing that kids would love to see who plays their favorite characters, but many of the voice actors admitted that it’s hard to perform their signature voices for children. Blum openly admitted “I scare children” and North recounted a story of scaring a child in a toy shop by using his characters voice for a child buying an action figure. Baker recalled trying to read the Hobbit to his daughter, who hated his use of funny voices and insisted he use his natural voice. It will still be a bit of the wait till the series comes out, but for now the original documentary is also back on iTunes for rent or purchase and is also available on Netflix.